ePublishing Knowledge BaseePublishing Knowledge BaseePublishing Knowledge Base Creating and Managing Directories & Buyers GuidesHow do I create a new directory category? Each of these categories was created in your Taxonomy Manager. This article will show you how to add directory categories. 1. 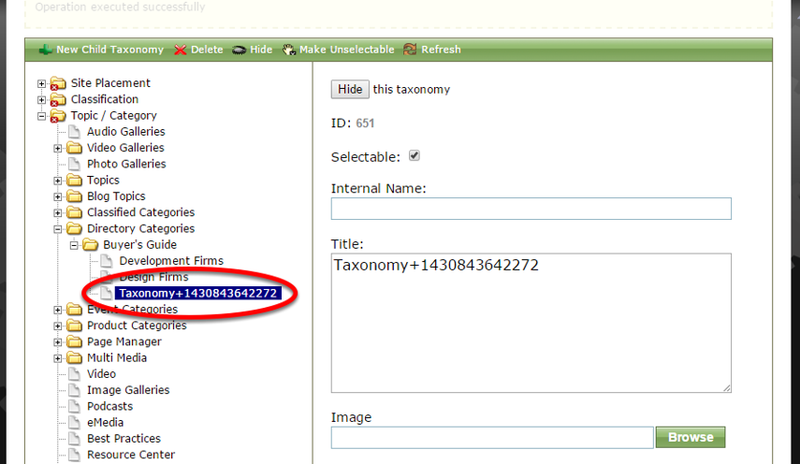 To add a new directory category, go to your Taxonomy Manager under Sales/Marketing in your dashboard. 2. 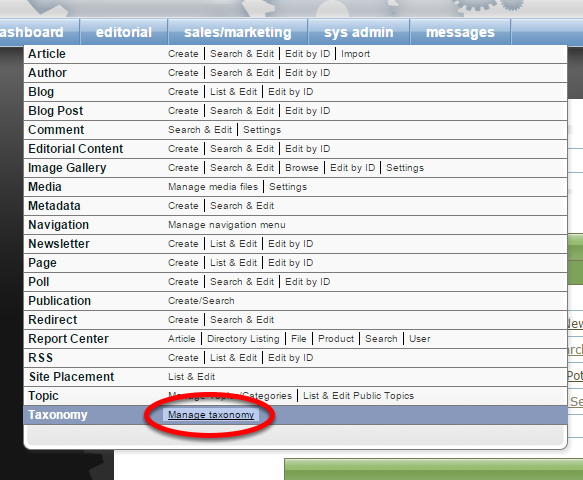 Click the + icon next to Topic/Category to expand the folder's contents, then Directory Categories. 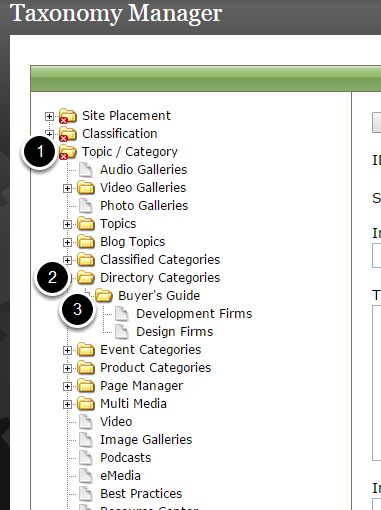 In the example above, the existing categories live in the Buyer's Guide folder. Each website's taxonomy is unique. If you have questions, please contact your solutions manager. 3. To add a new category, click on the folder where you want it to live, ideally in the same folder existing categories already exist. Zoom: To add a new category, click on the folder where you want it to live, ideally in the same folder existing categories already exist. 4. 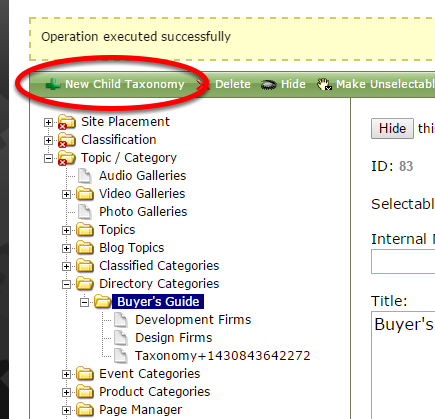 Click New Child Taxonomy. 5. Your new category will appear in the folder. Click on it to edit. Zoom: Your new category will appear in the folder. Click on it to edit. 6. Type the new category name under Title. Zoom: Type the new category name under Title. 7. Add a description and click Save. 8. If the new category was created successfully, a yellow bar will appear. Zoom: If the new category was created successfully, a yellow bar will appear. You may add additional categories, or delete, hide or make certain categories unselectable by using the menu bar at the top of the Taxonomy Manager. 9. To add a listing to your new directory category, create or edit a listing. Under Topic/Category select the new category. Zoom: To add a listing to your new directory category, create or edit a listing. 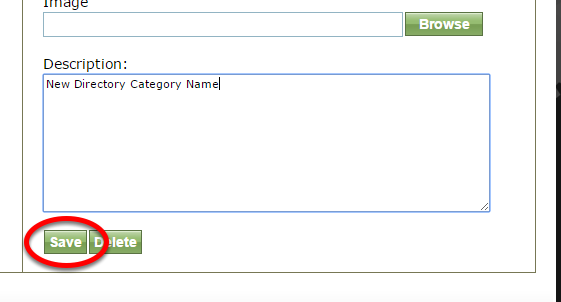 Under Topic/Category select the new category. Learn more about creating a new directory listing here: How do I create a new directory listing? Prev: How do I approve or edit a customer-submitted directory listing? Next: How do I display different tabs on my directory listings for different types of content?